Women had first formulated their demand for the right to vote in the Declaration of Sentiments at a convention in Seneca Falls, New York, in 1848, and saw their first opportunity of securing suffrage during Reconstruction when legislators—driven by racial animosity—sought to enfranchise women to counter the votes of black men following the ratification of the Fifteenth Amendment. By 1900, the western frontier states of Colorado, Idaho, Utah, and Wyoming had already responded to women’s movements with the right to vote in state and local elections, regardless of gender. They conceded to the suffragists’ demands, partly in order to attract more women to these male-dominated regions. But women’s lives in the West also rarely fit with the nineteenth-century ideology of “separate spheres” that had legitimized the exclusion of women from the rough-and-tumble party competitions of public politics. 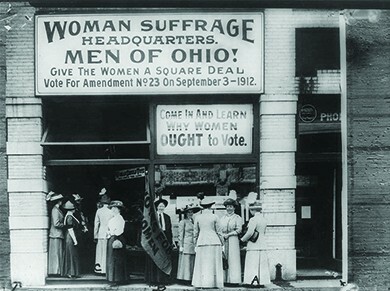 In 1890, the National American Women’s Suffrage Association (NAWSA) organized several hundred state and local chapters to urge the passage of a federal amendment to guarantee a woman’s right to vote. Its leaders, Elizabeth Cady Stanton and Susan B. Anthony, were veterans of the women’s suffrage movement and had formulated the first demand for the right to vote at Seneca Falls in 1848. Under the subsequent leadership of Carrie Chapman Catt, beginning in 1900, the group decided to make suffrage its first priority. Soon, its membership began to grow. Using modern marketing efforts like celebrity endorsements to attract a younger audience, the NAWSA became a significant political pressure group for the passage of an amendment to the U.S. Constitution. For some in the NAWSA, however, the pace of change was too slow. Frustrated with the lack of response by state and national legislators, Alice Paul, who joined the organization in 1912, sought to expand the scope of the organization as well as to adopt more direct protest tactics to draw greater media attention. When others in the group were unwilling to move in her direction, Paul split from the NAWSA to create the Congressional Union for Woman Suffrage, later renamed the National Woman’s Party, in 1913. Known as the Silent Sentinels, Paul and her group picketed outside the White House for nearly two years, starting in 1917. In the latter stages of their protests, many women, including Paul, were arrested and thrown in jail, where they staged a hunger strike as self-proclaimed political prisoners. Prison guards ultimately force-fed Paul to keep her alive. At a time—during World War I—when women volunteered as army nurses, worked in vital defense industries, and supported Wilson’s campaign to “make the world safe for democracy,” the scandalous mistreatment of Paul embarrassed President Woodrow Wilson. Enlightened to the injustice toward all American women, he changed his position in support of a woman’s constitutional right to vote. 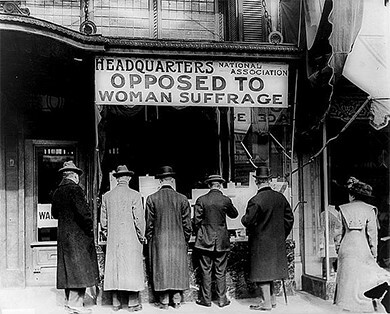 The early suffragists may have believed that the right to vote was a universal one, but they faced waves of discrimination and ridicule from both men and women. The image below shows one of the organizations pushing back against the suffragist movement, but much of the anti-suffrage campaign was carried out through ridiculing postcards and signs that showed suffragists as sexually wanton, grasping, irresponsible, or impossibly ugly. Men in anti-suffragist posters were depicted as henpecked, crouching to clean the floor, while their suffragist wives marched out the door to campaign for the vote. They also showed cartoons of women gambling, drinking, and smoking cigars, that is, taking on men’s vices, once they gained voting rights. In a speech delivered at the Cotton States and International Exposition in Atlanta in 1895, which was meant to promote the economy of a “New South,” Washington proposed what came to be known as the Atlanta Compromise. Speaking to a racially mixed audience, Washington called upon African Americans to work diligently for their own uplift and prosperity rather than preoccupy themselves with political and civil rights. Their success and hard work, he implied, would eventually convince southern whites to grant these rights. Not surprisingly, most whites liked Washington’s model of race relations, since it placed the burden of change on blacks and required nothing of them. 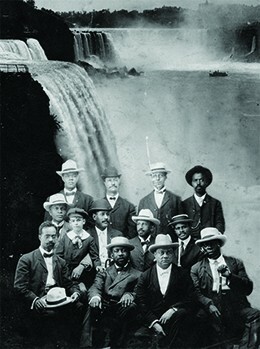 Wealthy industrialists such as Andrew Carnegie and John D. Rockefeller provided funding for many of Washington’s self-help programs, as did Sears, Roebuck & Co. co-founder Julius Rosenwald, and Washington was the first African American invited to the White House by President Roosevelt in 1901. 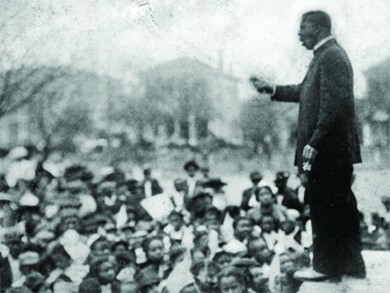 At the same time, his message also appealed to many in the black community, and some attribute this widespread popularity to his consistent message that social and economic growth, even within a segregated society, would do more for African Americans than an all-out agitation for equal rights on all fronts.